From the languages and programming environments like C, the .NET CLR and Java we are know proxy generation mechanisms based on IDL and RPC for a long time. These generated classes and files enable the programmer to call a server-side method by calling a local method with the same name. The implementation of the network transfer is taken off your application code. This Proxy generator can be used on its own but is also part of an AJAX framework available through my blog side http://ajaxaspects.blogspot.com/ that is still under development. Some AJAX implementations use their own way to transport the information between the client and the server. This implementation uses the standard SOAP protocol and works on Internet Explorer and the Firefox browser. The complete source of ajax.js can be viewed here: view ajax.js. Here you see an asynchronous call. The function CalcPrimeFactors() returns immediately and the client side scripting continues. After some milliseconds (or longer) the server will send back the result of the called method of the WebService and the value will be passed to the hooked up method as a parameter. There is also a synchronous version that can be used. In this case the func attribute must remain unset or null and the result of the server-side method is directly returned from the client side method call. This kind of calling the server may block for some milliseconds because no user-events like typing or clicking are processed during the call. proxies.CalcService.func = null; // no hook up function ! var f = proxies.CalcService.CalcPrimeFactors(12); // call the server and return the result. Here is a sample extract of the code that is generated for the client to shows how the mechanism works. // A WebService for the calculation of prime factors. 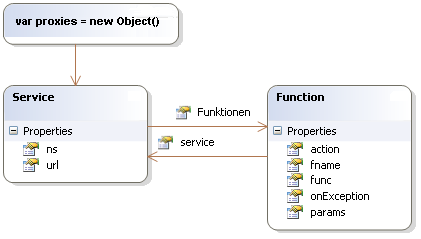 For each WebService method a function on the client is created that mirrors the method on the server. The information we need to build up the full SOAP message is attached to the function object as attributes. The proxy implementation also offers a client-side caching feature. An approach that leads to less traffic on the net because repeating the same calls can be prevented. The Http caching features, instrumented by using HTTP headers do not help in these situations because the request is not an http-get request and there is always a payload in the http body. Caching must therefore be realized by some scripting on the client. The cache doesn't clear itself. It can be cleared by calling EnableCache once again. Only methods with a single parameter are supported. proxies.service.function() Calling a server-side method. proxies.service.function.func This property is used to assign the function that receives the result of the server call when commincating asynchronously. proxies.service.function.onException This property is used to assign the function that receives the exceptions of the communication and server site execution of the call. proxies.service.function.corefunc Debugging helper function that should normally be null. See below. proxies.EnableCache(func) The function for enabling the caching feature of a specific server-side function. proxies.IsActive() This function returns true when a asynchronous call is started and waiting for the response. proxies.cancel(raise) This function can be called to cancel the running asynchronous WebService call. the parameter raise can be set to false to prevent the raising an exception. proxies.alertResult A function that can be used to show the result of a SOAP response as text. See below. proxies.alertResponseText A function that can be used to show the real text of a SOAP response. See below. proxies.alertException A function that can be used to show eventually thrown exceptions. This is the simples case of passing exceptions to the user. proxies.service.url URL of the WebServices. proxies.service.ns Namespace of the WebServices. proxies.service.function() A small function is generated thet starts the communication by calling proxies.callSoap(). proxies.service.function.fname Name of the method. proxies.service.function.action Soapaction of the method, used in the http header. proxies.service.function.params Array with the names and types of the parameters. proxies.service.function.service A link back to the service object. proxies.EnableCache(func) The method for enabling the caching feature. proxies.callSoap() This function implements the start of the client-server communication by sending a SOAP message. proxies._response() The callback function for the XMLHttpRequest object that dispatches the response to servive.func or service.onException. ajax._getXMLDOM() Get a browser specific implementation of the XMLDOM object, containing a XML document. proxies.current A property that references the current executed function during a call. proxies.xmlhttp A property that hold the current active XMLHttpRequest object during a call. With proxies.service.function.corefunc is an entry point in the core implementation of the proxies object available that may be helpful when analysing problems. Instead of attaching a special function for the further processing of the respose of a WebService Call it is possiblble to just hook up the window.alert function to display the result. I recommend always attaching a function for handling possible exceptions, at least while developing. When calling a WebService asynchonously there will be no executing code that can catch an exception so you must provide a method in this case. With Version 2.0 there is now more support for different datatypes. Up to now only those methods where supported that where converting of the parameters and result values was not necessary. This applies to strings and numbers. Passing XML documents was implemented to make it possible to pass complex data. In the supported browser clients the XMLDocument Object from Microsoft or Firefox and on the server the .NET XmlDocument class can be used. The proxy functions also accept the XML document as a string type. In this case, the contents of the passed string is passed directly to the server any must for this reason contain a valid XML document without the declarations any without any "XML processing Instructions" like <? ... ?>. With this datatype it is possible to pass complex data directly to the server an there is no need to define a method with many parameters if using this datatype. If the data scheme is extended with new fields it will not be necessary to give a new signature to the WebService. The disadvantage of this approach is that the content of the XML document cannot be validated by the WebService infrastructure because there is no schema for this part of the conversation available. The transmission of the SOAP/XML Messages can be implemented using the appropriate XMLHTTP object that is available in many state-of-the-art browsers today. This implementation was (until now) tested with Internet Explorer and Firefox. More details and some more internal description can be found in ajax.js include file. // req.Proxy = WebRequest.DefaultWebProxy; // running on the same server !